Greenbushes is located 251 km south of Perth and 85 km south of Bunbury, approximately 2.5 hours drive from Perth. 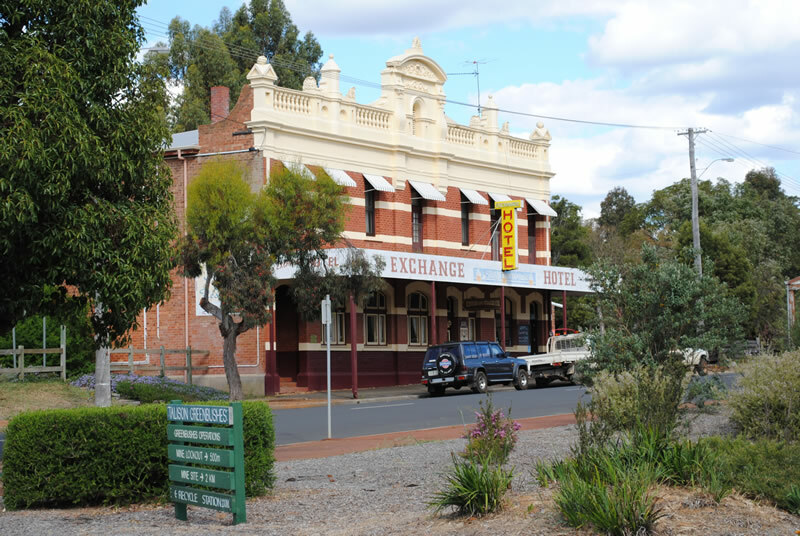 The Exchange Hotel is located in the southern end of the town and is perhaps the most dominant feature of this south west location. The Exchange Hotel on the southern end of the town’s main street is a testament to the town’s early prosperity. 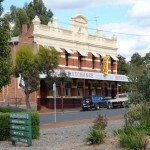 Built in 1907, the hotel is a brick double storey building with an elaborate plaster pediment on the front façade. Although the original verandahs have been replaced by an awning, the building retains a high level of original details both externally and internally. The building contains original leadlights, fine jarrah detailing including the staircase and balustrade . Look for the original pressed tin ceilings (see video). 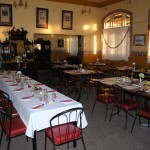 The building is typical of hotels built in the late 1800’s and early 1900’s in Western Australia. Today it boasts simple but comfortable accommodation, an excellent dining room and Stinton’s Café. An area of subsidence at the rear of the Exchange Hotel has puzzled many residents. Some believe it is the remnants of an old mine tunnel which, fortuitously for thirsty miners, surfaced at the rear of the hotel.